Elegant Carrot Souffle | Just The Right Spice! Wow your dinner guests with this easy, but elegant carrot soufflé. They’ll think you slaved in the kitchen all day, when this can be made ahead several days in advance and then put in the oven a hour before dinner! Directions: Prepare carrots and cook until tender, drain well. Put carrots and eggs in a blender. Then add the remaining soufflé ingredients. Place mixture in a greased 2-qt. pan or soufflé dish. Can be prepared ahead to this point, and refrigerated until ready to cook. Bake at 350 degrees for 30 to 50 minutes. Mix together walnuts, brown sugar and soft butter until crumbly. Spread on top of baked soufflé and bake for an additional 5-10 minutes. 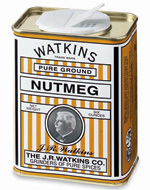 Tips from the kitchen: the Watkins nutmeg and vanilla really make this dish, so don’t leave them out!